Structure of Cell [Part 1] ~ Pass. Science. Solutions. An average cell varies from 0.01mm to 0.1mm in diameter. The cell of Acetabularia, an unicellular algae is about 10 cm long. The Ostrich egg is the largest cell which measures about 6 inches or 170*135mm and the smallest living cells are bacteria (0.1-10 micron). The smallest cell is Mycoplasma gallisepticum (0.1 to 0.2 micron). The nerve cells are the longest cells, that measure upto over a metre. A micron is one-thousandth (10^-3) of a mm or 10^-4 cm. One thousandth of a micron is millimicron, which is equal to 10^-6mm or 10^-7cm. Under the electron microscope, the unit of measurement is angstorm. An angstrom is one-ten-thousandth (10^-4) of a micron or ten-millionth (10^-7) of a mm. Depending upon function, needs of organism and environmental conditon, the shape of cells vary widely. They may be sperical, oval, rounded, elongated, tubular, cylindrical, discoidal, rod-like, polygonal or irregular in shape. Cell wall is the outermost covering of a plant cell secreted and maintained by the protoplasm. It is not found in animal cell. It is non-living and permeable in nature. It provides a definite shape and protection to the cell. Being permeable in nature, the cell wall allows the movement of useful substances like water and gases between cell and environment as well as one cell to another cell. The cell wall consists of three layers: middle lamella, primary wall and secondary wall. Middle Lamella: Formation of middle lamella starts in the telophase stage of cell division. It is a thin common layer present between the two adjacent cells. It is made up of calcium and magnesium pectate. The pectin layer of middle lamella can absorb water and act as a cementing material between two cells. Primary Wall: It is synthesized by protoplasm on either side of middle lamella in a growing cell. It is 1-3 micron in thickness. It is made up of cellulose, hemi cellulose, pectic substances. Cellulose is a polymer of both hexose and pentose sugar, while pectin is a polymer of uronic acids (derivatives of hexose sugars). Secondary Wall: In fully mature cell, secondary wall is formed internal to the primary wall. Secondary wall is rigid, inelastic and 5 to 10 micron in thickness. It consists of lignin in addition to cellulose, hemicellulose and pectin. Lignin is a complex polymer of aromatic compounds. It makes the secondary wall very strong and rigid. It is usually formed in non-living cells such as fibres, tracheids, xylem vessels and other sclerenchyma. There are some other substances such as cutin, suberin, wax, mucilage and silica usually deposited outside the cell. Cutin, suberin, wax make the cell wall impervious to water and prevent loss of water from cells. The primary and secondary wall are discontinued at some places and form pits, which ae called plasmodesmata. The animal cell lacks cell wall. The cell membrane forms the outermost covering of cell. The semi-fluid mass of cytoplasm including nucleus is called protoplasm. Huxley describes protoplasm as the physical basis of life. Protoplasm with non-living inclusions, excluding cell wall is called protoplast. Protoplast is a complex colloidal system of substances. It is difficult to determine the exact chemical composition of the living protoplasm. However, the chemical analysis reveals that water constiutes about 75% to 90% of protoplasm. In absence of water, protoplasm becomes inactive and dead. The remaining part of the protoplasm contains several organic and inorganic substances. The common organic compounds are proteins, carbohydrates, nucleic acids, lipids, etc. Proteins constitute about 40-60%; Carbohydrates 12 to 14%; lipids 12 to 14%; and nucleic acids 1.5% of the total dry weight of the protoplasm. Lipids are found in the form of natural fats, fatty acids, fatty oils, phosphatides, waxes and steroids. Inorganic salts include sixteen essential elements. These elements are found in ionic forms and constitute about 5-7% of the total dry weight. Cell membrane is the outermost covering of the cytoplasm. In an animal cell, it forms the outermost covering of cell, whereas in plant cell, it is internal to the cell wall. In eukaryotic cell vacuoles and cell organelles remain surrounded by separate membranes, similar to the cell membrane. The cell membrane and the sub cellular membrane are collectively known as biological membrane. Cell membrane consists of proteins, lipids and carbohydrates. Proteins are of three types: Structural protein, enzymatic protein and carrier protein. The lipids are mostly present in the form of phospholipids. Bal (1996) reported the presence of RNAin the membrane of nucleus, endoplasmic reticulum and plasma membrane of allium cepa. DNA is reported from the membranes of mitochondria, chloroplast and plasma membrane. Cell membrane is about 75 angstrom in thickness. Lipids are present in two layers which are externall bounded by two surface layers of protein. The hydrophilic heads of the lipid layers project towards the protein layer, while their hydrophobic tails lie towards the inner side of the membrane. Most of the protein and many of the lipid molecules have short carbohydrate chains attached to them. These molecules are called glycoproteins and glycolipids. 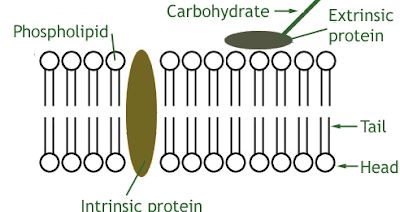 The carbohydrate chains are all on the outer surface of the membrane. No carbohydrate is located at the inner surface i.e. cytoplasmic surface of the plasma membrane. Glycolipids and glycoproteins help to stabilise membrane structure by forming hydrogen bonds with water molecules outside the membrane. The plasma membrane is a complex barrier and differentially permeable in nature, while water and gases easily pass through it by diffusion. The selective nature of the membrane is of great significance to the cell, as it determines what should pass across it. Therefore, it is called a selectively permeable membrane. The semi-fluid mass of protoplasm excluding nucleus is called cytoplasm. Cell membrane forms the outermost covering of the cytoplasm, while nucleus forms the internal boundary. It is transparent and structureless. It consists of various kinds of biochemicals like water, minerals, sugars, lipids, proteins, nucleic acids and a variety of enzymes. It is semipermeable in nature. It contains a number of structures of immense physiological importance. These are of two types: (1) living cytoplasmic organelles and (2) non-living inclusions. Cytoplasm helps in the intracellular distribution of nutrients, metabolites and enzymes. It helps in exchange of materials between cell organelles. It is the site of glycolysis and biosynthesis of fatty acids, nucleotides and many proteins. Cyclosis: The streaming movement of cytoplasm within the eukaryotic cells is called cyclosis. It helps in movement of cell organelles, distribution of food and other cell inclusions. It also helps in formation of pseudopodia in Amoeba. 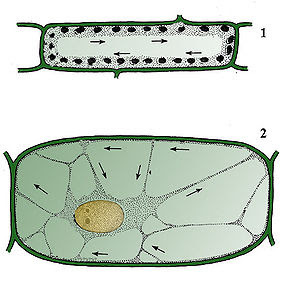 The cyclosis may be in one direction (clockwise or anticlockwise) around the central vacuole or in several directions around small vacuoles. It depends upon the temperature and viscosity of the cytoplasm. The process of cyclosis can be easily obsereved in laboratory. For this purpose take a young leaf of Hydrilla and place it on a clean slide in some drops of water. Observe the cells. You will see the chloroplasts are moving in one direction. It shows the streaming movement of cytoplasm. If you mounted a filament (stamen) or Tradescantia , you will see cyclosis in different directions in the staminal hair cells. Endoplasmic reticulum: Endoplasmic reticulum was first of all reported by Porter (1945) in all living cells of plants and animals. It is a system of membranes which forms a branching network of tubules [formed by membranes] throughout the cytoplasm. The endoplasmic reticulum arises from the outer membrane of the nucleus and extend up to the cell membrane. the membrane of ER are lipoprotein in nature and shows similarities with plasma membrane in structure and appearance. Each membrane is 50 angstrom in thickness. The endoplasmic reticulum is composed of three types of structure: Cisternae, Vesicles and Tubules. Cisternae are elongated, flattened, sac like unbranched structures. They are 40 to 50 millimicron in diameter. They are arranged in parallel stacks. They occur in those cells which have synthetic roles like pancreas, brain etc. Vesicles are round, dpherical or oval spaces. They are 25 to 500 millimicron in diameter. They remain isolated in the cytoplasm. Tubules are branched, irregular structures. They form reticular system alongwith the cisternae and vesicles. They are 50 to 200 millimicron in diameter. they occur in almost all the cells. Depending on the nature of membranes, the endoplasmic reticulum is of two types: Rough Endoplsmic Reticulum and Smooth Endoplasmic Reticulum. Rough endoplasmic reticulum bears ribosomes on its outer surface and becomes rough or granular in appearance. Rough endoplasmic reticulum is the site of active protein synthesis. When endoplasmic reticulum is free from ribosomes it is called smooth endoplasmic reticulum. It may form the site of lipid synthesis. It forms skeletal framework withinth ecytoplasm and gives mechanical support to the cell. It acts as storage, circulatory and secretory system in cell. It contains many enzymes and performs various metabolic activities. It helps in intracellular transport of various metabolites. Smooth ER takes part in biosynthesis of fatty acids and phospholipids. Rough ER helps in biosynthesis of protein. It helps in exchange of materials betwwen the cell and environment. It also provides increased surface for various enzymatic reactions. It conducts intra-cellular impulses from the surface membrane into the deep region of the muscle fibres. It forms new nuclear membrane after each nuclear division.